After a six day flow test to determine the generation capacity of a geothermal production well in Laudat, Dominica has successfully recorded its first commercial geothermal well. 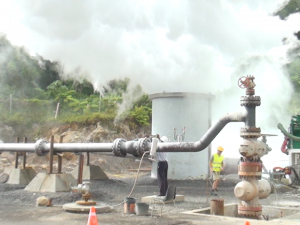 Speaking at a press conference on Monday June 17th, Alexis George, Project Officer of the Geothermal Project Management Unit, said results from the flow test indicate that the well is productive and can be used for electricity generation. The test report indicates that Dominica could generate over ten megawatts of electricity. Vice President of the Geothermal Resource Group, Will Osborn said this is enough to replace the current diesel power generation on the island and bring energy independence to Dominica. Meanwhile, Prime Minister, Honourable Roosevelt Skerrit also speaking at the press conference, said that he has had to increase the amount budgeted for Government’s energy costs for the year 2013-2014. “In this year’s budget coming up as the Minister of Finance, I had to increase the energy cost…The monies we budget every year for electricity will be increased in this year’s budget because the price of the petroleum products have gone up and therefore our light bills will go up,” he said. He added that the solution to high energy costs is geothermal energy, as he called on all Dominicans to embrace the project. The Prime Minister indicated that his Government will continue to venture into geothermal energy as an alternative power source. Last week’s well testing procedure was part of an ongoing exploration and development process authorized and supported by the Government of Dominica.